Remembering Elvis - Featured Album Cover Art. What's Next? Hot Rods & High Heels! Dion turned 78 on July 18th of this year. I remember watching Dion and The Belmonts singing "Teenager In Love" from the balcony on the American Bandstand show in 1959. 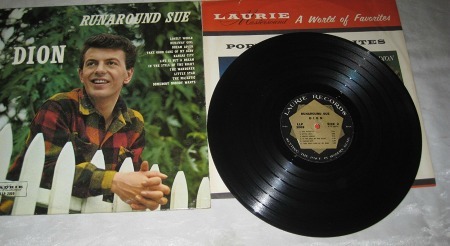 His biggest song was "Runaround Sue" as a solo artist in 1961. It was released in September of ’61 and by October it was #1 in the U.S. It gained gold record status (1 million sales) in early 1962. An amazing statistic for any performer is that Dion has been married to Runaround Sue for 54 years. Dion has said in interviews and books that his wife, whose name happens to be Susan, (Susan Butterfield) is not the Sue of song fame. 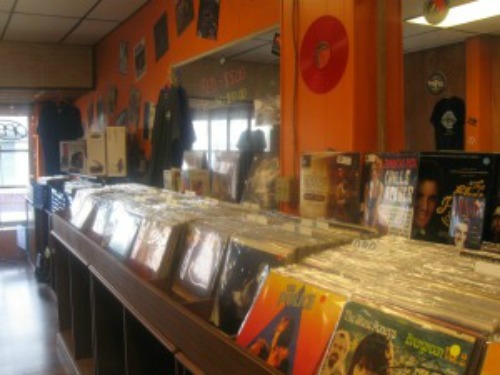 Hamilton, Ohio's Newest Vinyl Record Store. Click on photos below for expanded view. 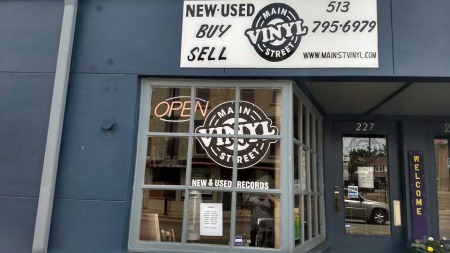 About a month ago my friend, Gary Ritchie, sent me a link to a new vinyl record store in our home town of Hamilton, Ohio. When I went to our scheduled class reunion the weekend of the 5th I decided to stop by and take a look. I was greeted by a friendly individual who turned out to be the owner, Bill Herren. 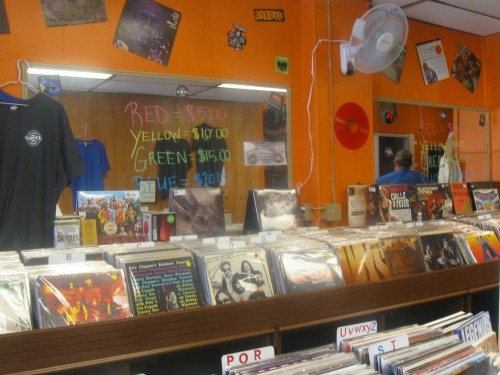 Bill said he and his two sons, Scott and Jason run the store with an inventory of around 5,000 records. Albums included rock, blues, soul, jazz and country. 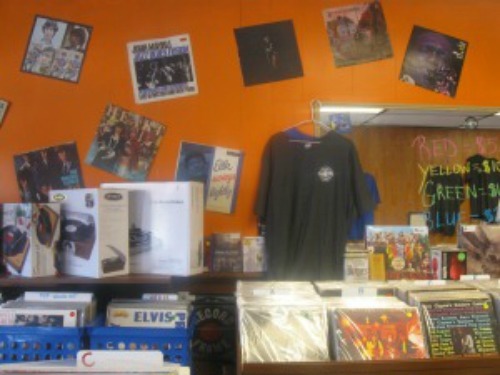 Also for sale are new and used turntables, record-cleaning supplies, T-shirts and used CD's. The store is small but well laid out. Bill said it didn't take long to run out of space and they were already in the process of expanding the store. I was only in the store a short while but could already see why expansion was necessary. Customers were smiling and the owners were knowledgeable and friendly. The store had a nice family feel to it. A very nice and much needed locally owned vinyl record store is Hamilton's newest gift to the vinyl record junkie. A class reunion reflects on a memorable year. Remember those famous words "Where were you in '62" from the classic film "American Graffitti"? (opens new window). Our graduating class from 1962 enjoyed a wonderful evening on August 5th, 2017. People change over the years and name tags helped, but it warms the heart to sit and visit with old friends with whom you share a common history. It was nice to reconnect with those classmates I have not seen since our 1962 graduation. If any classmates happen to find your way here, thank you for a memorable evening. Our classmate and friend, Gary Purvis, provided memorable entertainment with his band, "Chaser." Gary is the Saxophone player in the photo above. If you live in the Hamilton, Ohio or surrounding areas give Gary a call at 513-382-3818 or contact via his email at (purvischaser9@aol.com). 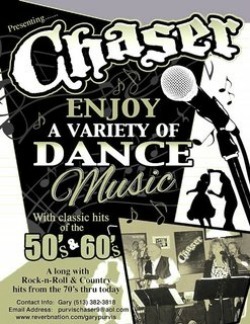 The "Chaser" band with Barb Talbot and Rick Fischer will make your evening a lasting memory. A Runaway hit at the Del Shannon Car Show. 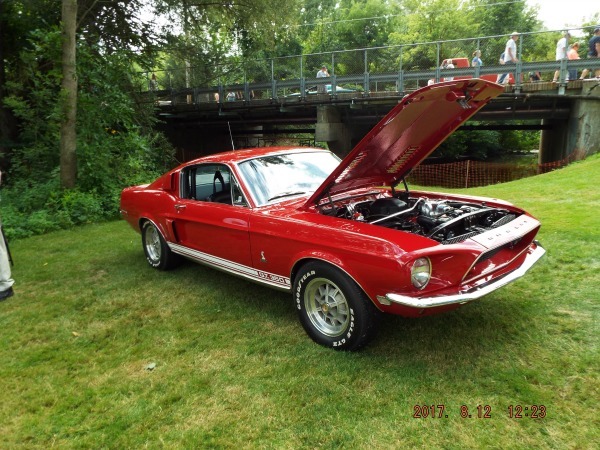 The "Del Shannon Days" car show was, as it is every year, a big hit with over 600 custom cars on display. 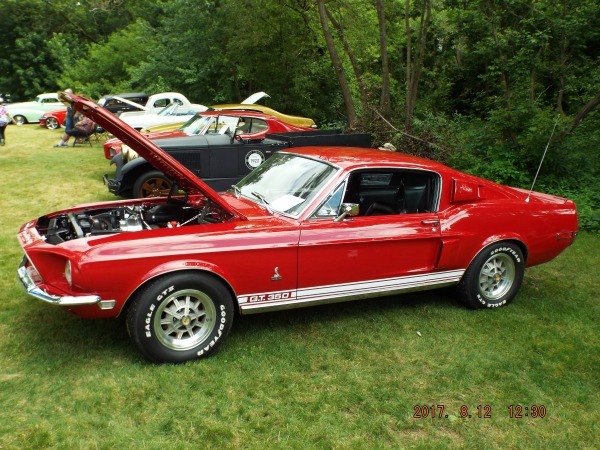 One classic that will always be special is any Shelby Mustang. There were a few on display, but one in particular caught my eye and was extra special due to the history and story behind the car. 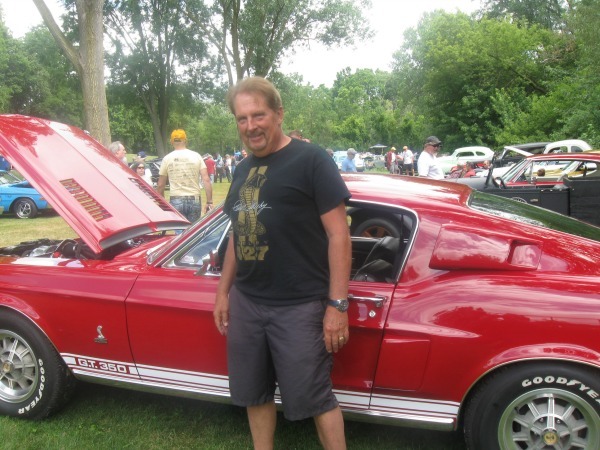 Rick Collett (pictured with his car) of Grand Haven, Michigan told me he purchased his dream car, a 1968 Shelby Mustang GT350, at a Grand Rapids dealership when the car was new. He said he had recently graduated from high school when he walked into the dealership in 1968 and sat down in his dream car. A salesman approached the long haired teen and said "Get out of that car, boy." I failed to ask Rick how the salesman reacted when he ended up buying the car or how many miles was currently on the car. Rick was kind enough to share his story with me and gave me details on the car. He has owned the car for nearly a half century and said he has never considered selling the car. The car is equipped with an optional factory supercharger and came with an 8-Track tape player. I'll bet some of you reading this have no idea what an 8-track tape player looks like. 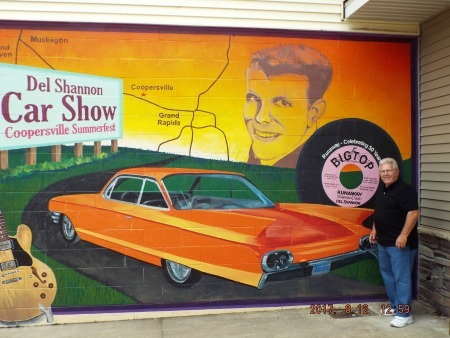 Looking forward to next year and the 28th Del Shannon Days custom car show. Hope to see you there Rick. Featured Album Cover Art of the Month. Click to expand album covers. Have you heard the news...There's good rocking tonight" are lyrics from Elvis' second-ever Sun Record released in 1954, but on August 16, 1977, the news that quickly spreads around the world is not good: The King is dead. It has become an annual ritual to gather at Graceland on the anniversary of Elvis' death. Many fans cherish the possibilty that Elvis might still be rockin' tonight. In reality, certainly, someone, somewhere, is playing his song at any moment. August 16th, 2017 will be 40 years since Elvis died. I considered this to be an appropriate month to add two very special Elvis albums as my featured "Album Cover Art" of the month. The two Elvis original albums shown above were purchased in 1976 and have the identical price tags ($4.99 each) still attached to the outer shrink wrap on the albums. I recorded both albums onto a reel to reel tape and they have remained in their original album covers since 1976. They are shown framed as I had them displayed on my hobby room wall. 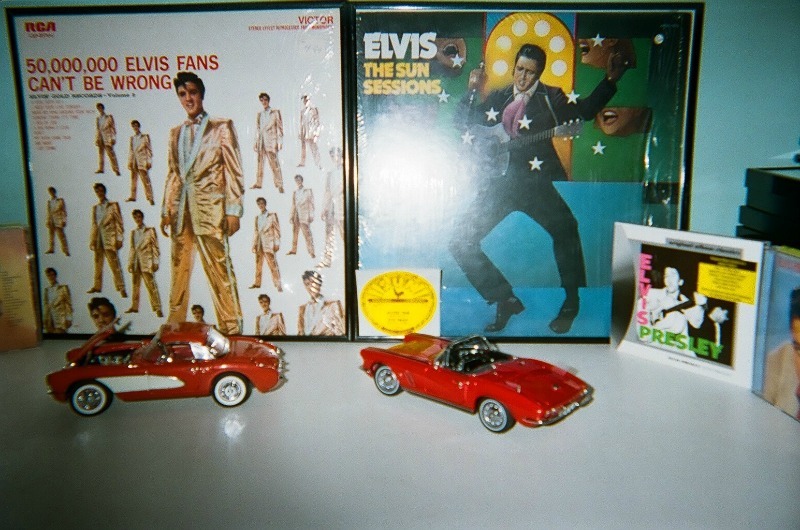 The Elvis Gold Records, Vol 2 (Elvis in gold suite) Stero version was originally released 1962 (Mono version 1959). I purchased the original 1962 album but lost it over the years and bought the replacement in 1976. The 1976 album, LSP-2075(e) is labeled "Stereo Effect Reprocessed From Monophonic." The Sun Sessions Album is early Elvis at his finest. With good stero equipment Scotty Moore's guitar on "Mystery Train" will leave you feeling as if that train is coming right into your living room. A real treat listening to this classic rockabilly sound. Glen Travis Campbell died Tuesday morning, August 8th, 2017 in Nashville. He was 81. 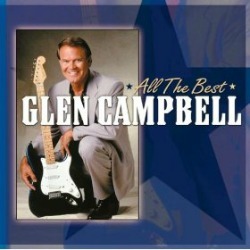 Glen won five Grammys, sold more than 45 million records, had 12 gold albums and 75 chart hits, including No. 1 songs with "Rhinestone Cowboy" and "Southern Nights." My friend, Paul Giacalone Jr, called me on Sunday, August 13th, to inform me that Richard Adam Ziegler, who was known professionally as Ritchie Adams, died on March 6 after a long-term illness at the age of 78. Ritchie Adams (top center in photo) was lead singer on the Fireflies original song "You were Mine." 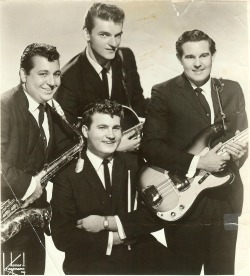 The song was written by Paul's dad, Paul Giacalone Sr. (center bottom). His songwriting career, though, included numerous top forty hits on various charts including the hits Tossin' & Turnin' for Bobby Lewis (#1, 1961) and After The Lovin' for Engelbert Humperdinck (#8, 1977). What's Next? Hot Rods and High Heels! copyright photo property of Gilmore Car Museum. 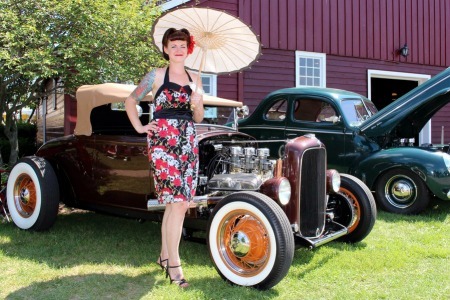 Head out to the Gilmore Car Museum for an event you won’t forget — the 9th annual Traditional Hot Rods, Customs, and Motorcycle Show! You WON’T find neon lights, billet wheels or modern megawatt stereos on these relics, just good old fashion hot rods like they built them in the 1940s, ’50s and early ’60s. Plus, check out live bands, enjoy the pin-up contest, and more throughout the day! For more information visit Relixriot.com. Saturday, August 19th, 9am-4pm at the Gilmore Car Museum.